I've noticed a couple of people who always trim their sago trunk with a electric hedge trimmer. It leaves a smooth rounded trunk. 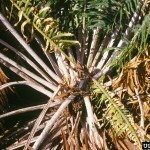 It looks nice and trimmed, but does this hurt the sago palm? Also, they remove all old growth branches and leave new branches. I'm old fashioned. I like a full branch cover sago. Yes, I agree in removing old damaged branches or yellowed ones. What's your opinion?